Fried food is synonymous with southern cuisine! Mississippi’s home-style culinary scene features some of the most mouthwatering fried foods you’ll find in the country, from chicken to seafood to things you didn’t even know could be deep fried! Do dinner in true southern fashion at these 10 best places for fried food in Mississippi. Don’t let the name discourage you from tasting some of the best fried foods in the state! They’ve got it all, from country fried steak to fish and shrimp to chicken tenders, fried pickles, jalapenos, boudin balls, crawfish, and more. And yes, they’re one of the few places in the state where you can get some fresh-cooked rabbit—don’t knock it 'til you try it! If you’re looking for some of the most authentic flavors in Mississippi, you won’t want to pass up the chance to eat at Jugheads. Their famous deep-fried lineup includes traditional eats like shrimp, fish, and chicken, along with southern favorites like frog legs and gator bites. There’s plenty for every palate, and rest assured you’ll be back for more! It doesn’t get any more “Mississippi” than a fried green tomato! Their daily buffet specials span the full country cuisine spectrum, including fried sirloin steak, fried pork chops, and of course fried catfish. Other fried favorites include chicken, chicken livers, French fries, and their namesake fried green tomatoes that are worthy of a meal in itself. This old-school eatery has been dishing out the best in fried fare since 1969. Classics like fried green tomatoes, jalapeno poppers, fried dill pickles, mushrooms, onion rings, and catfish comprise a menu that’s bursting with flavor. Whatever you’re craving, you’re likely to find it here. This delightful lineup of traditional southern staples will have your mouth watering the moment you see the menu. Fried hushpuppies, squash, chicken livers, mushrooms, shrimp, and potato cheese poppers make the perfect start to your meal—or even as a meal themselves! For heartier appetites, they have tons of fried seafood and chicken options that will leave you feeling fulfilled. A long-time staple in Jackson’s cuisine scene, they’ve been dishing out the best hot chicken sandwich in the city since 1984. Their dishes infuse influences from Creole, Latin, and southern comfort food, giving you something new and exciting to taste every time you visit. Portions are plentiful and service is quick, giving you all the more value in your meal. This hometown hero knows how to do southern fried everything the right way. Fans flock here for the best chicken biscuits in the state, along with chicken dinners that will feed the whole family. And don’t forget to try their most surprising find—blueberry doughnuts that beat the typical doughnut shop, hands down! This southern fried food outfitter has some of the best fried seafood in Mississippi. Take advantage of their all-you-can-eat nights that let you fill up on catfish or popcorn shrimp for one low price. Their menu also includes all your deep-fried favorites like crab claws, crawfish, shrimp, oysters, fish, chicken, and more! This fried chicken outfitter is truly a gem on the Gulf Coast. 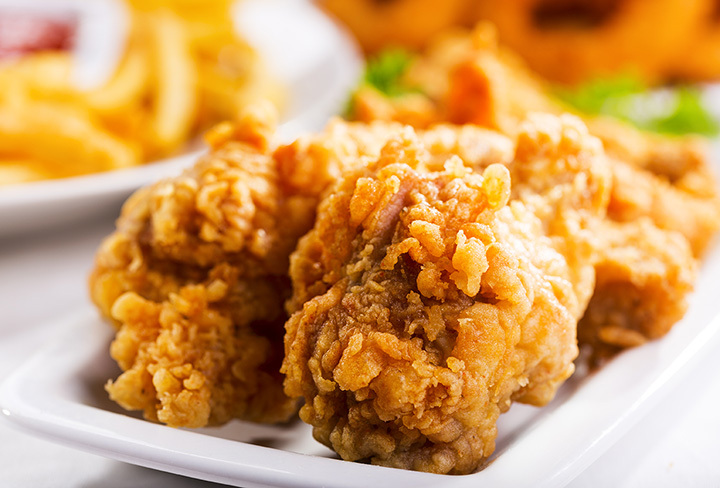 They’ve got a buffet fully loaded with their famous fried chicken, country-style sides, wings, strips, fish, and other goodies. You’ll want to make another trip through the line—don’t be shy about getting your money’s worth! The only thing that’s better than some amazing fried food is having amazing fried food on an All You Can Eat buffet. This country-cookin’ buffet lets you eat your fill of their delicious fried chicken, pork chops, and all the country sides you need to complete your meal. Pay one price and fill up as much as you like!